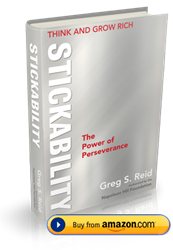 Napoleon Hill once said, “Most great people have attained their greatest success just one step beyond their greatest setback and failure.” That idea is at the heart of Greg S. Reid's most recent book, Stickability, which is now available at Amazon.com. The April 1st launch of his newest book is no joke, and it's followed closely by the launch of the Stickability app—a companion to the book featuring personalized meditations, music, and powerful success-oriented affirmations. To produce Stickability, Greg has teamed up once again with the Napoleon Hill Foundation, a non-profit educational institution dedicated to making the world a better place through the insights of legendary American author, biographer, and success expert Napoleon Hill. Hill was the author of the seminal self-help classic Think and Grow Rich. "This book reminds us that with a Positive Mental Attitude, all things are possible." A portion of the proceeds from Stickability go to support the Napoleon Hill Foundation. For more information go to http://www.Stick-ability.com or contact Sheila Stewart at 303-378-2022 (c) 320.593.4413 or SStewart(at)SheilaStewartPR(dot)com.